Packed with mucho and fast moving music which is often crazed recitation and even screaming words that may or may not make one bit of sense to the listener. A 1970's Baltimore MA prog band, this is a difficult listen at times, but you must give it more than one listen thru to really get the best from it. It's rare, but there are even some really beautiful mellotron prog rock parts, although followed by the talking and the more zany concoction of jazz/rock/pop/classical in avant garde format. It's a good bet that lovers of early to mid period Gong ( nod to Dave Allen ) will dig this. Some of it reminds me of the more comical early British rock recordings and pieces of Frank Zappa, Supersister, Samla Mammas Manna (in their zany outrageous mode ) and some direct Beatles acknowledgment. With 30 songs, you get quite the kitchen sink of music styles but all in a very eccentric format. Also beware it sometimes sounds like music you and some of your friends might do one night after heavy drinking (or drugs, if you prefer). Both might be applicable. Previous opinions agree that much turmoil existed in the band, so much so that they had a chance to open for one of the finest USA prog music bands in America, THE MUFFINS, but tempers or stubbornness killed the chance. Now that is a lesson in stupidity for all bands to take notice of. 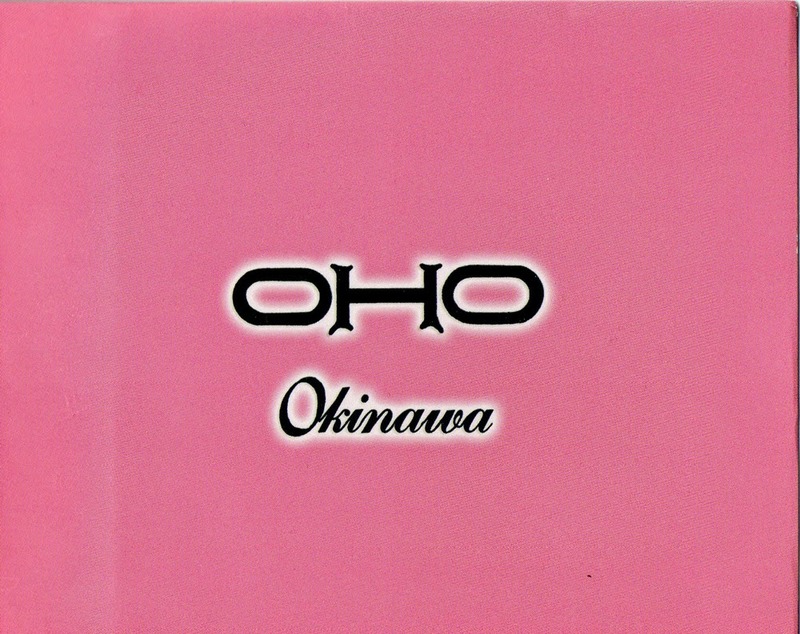 What stands out is the fact that OHO have an abundance of talent and most of the musicianship is really good to excellent. It's only the rushed recording and production that hurt them the most on this release. And for anyone who only owns their "Bricolage" or "Up" CD and not this one yet, then double beware, as both of those have female vocals and is melodic with exact song structure in the Blackmore's Night, Maggie Reilly, Pentangle, and a mix of more modern aggressive prog folk female fronted groups and early haunting folk bands. 'Okinawa' is ambitious, and it's crazy as hell most of the time, but RIO fans might just like this a good deal. If all this sounds a bit uneven, it is. You have to be in a receptive frame of mind to sit thru this almost 74 minutes of nonstop semi assault on your good nature. You might be like me and scratch your head when those moments of pure classic progressive rock ala VDGG come along. The rest of the time it's almost like Peter Hammill gone wild with some unknown bunch of backing musicians. The vocals sometimes singing, sometimes screaming, ranting, and talking, most remind me of Hammill in some imaginative varied states of mind. The conclusion of 'Okinawa' is a bit like weeding a garden so you have all the beautiful flowers left to adore. The last song really makes you wish the whole thing sounded like that,. But those abrasive and indulgent babblings, may be your weeds. That said, I felt exhausted after listening to the whole thing twice and then a 3rd time 2 days later. But I always keep my rule of a fair review, and listen to each disc at least 3 times before I commit the review publicly. Some discs get better and unveil their layers, and some may just sit at the same place after the 3rd listen. One thing for sure, this CD is an adventure and I didn't hate it. I actually really liked it for that mood where I just need something that gets nutty and beautiful all in one sitting. I loved some of it where it actually gets beautiful and big like those nice progressive rock songs we lust for.. Now excuse me while I weed the garden.